Latest track map ... LOL. Back to a Tully crossing. Having said that looks like it will be more of a trough system than a defined low. 105mms here at Marian, west of Mackay for the last two days. And I reckon Penny is about 15kms north of Airlie. Location: within 35 kilometres of 19.9 degrees South, 149.3 degrees East , 115 kilometres east of Bowen and 275 kilometres east southeast of Townsville . Movement: west at 6 kilometres per hour . Ex-tropical cyclone Penny has moved slowly to the west in the past few hours, and is expected to drift onto a slow west northwesterly track through today and Thursday. Based on the current forecast track, Penny is set to move roughly parallel to the Burdekin coast during today. 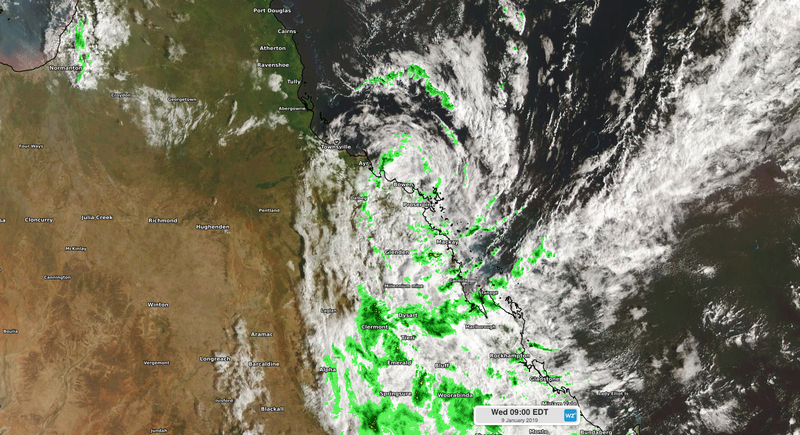 Penny is rated a very low chance of reforming into a tropical cyclone as it approaches the Queensland east coast. 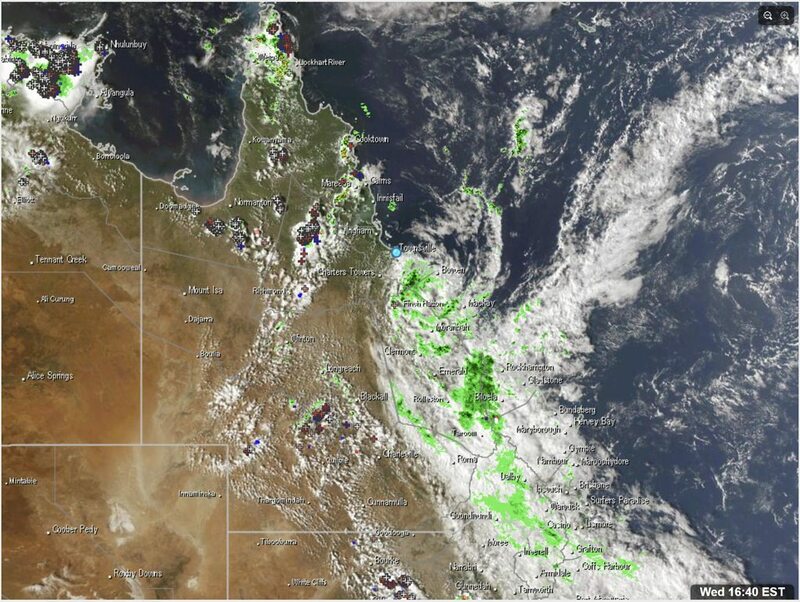 Although Penny remains as a tropical low, it is still expected to produce heavy rain about areas of the central and tropical east coast of Queensland, including the Whitsunday Islands, during today and Thursday. A Severe Weather Warning is current and can be viewed at http://www.bom.gov.au/qld/warnings/. A Flood Watch is current for coastal catchments between Gladstone and Cape Tribulation extending inland over parts of the Central Highlands and Coalfields. 147mm for St Lawrence currently. If you look at the BOM tracking map line which tracks the centre of the low. You will note that the southern more severe flank is south of that line. A week ago she flew right over the Weipa radar. With a penchant for 'look at me' Penny must be a Millenial. Fantastic images Learjet - pls keep them coming! Marine wind warnings for this system have been cancelled. SWW to be cancelled next?? The SWW doesn't mention winds, so it should still be issued for rainfall. She's very slow moving, its been sitting over Bowen since this morning. Forecast to be near Tvle by late today though. Some good rainfall amounts so far with many locations in the Central Coast district recording well in excess of 100mm in the 48hrs up to 9am this morning. 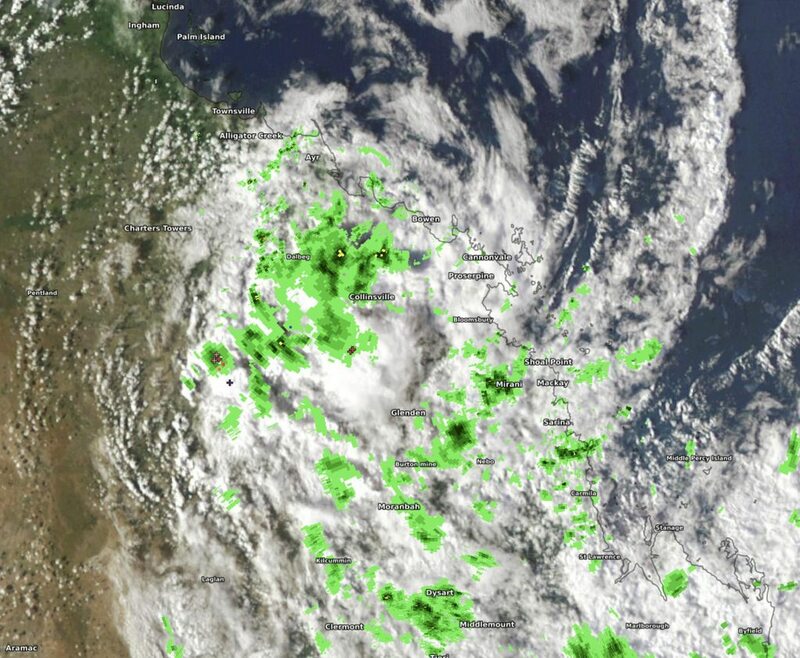 Shows up rain embedded in the arms nicely and the strong NE infeed from the coral sea. I haven't seen this color scheme on the BOM site. With the green denoting rain.What type of sat pic' is this. Poor old Bowen. 4mm of rain, gusting 11kts NNW. I fear Townsville is in for more of the same. I hope to be proved incorrect. 7 registered (wet sky, bbowen, Adaminaby Angler, Knot, scott12, samboz, 1 invisible), 62 Guests and 2 Spiders online.